I was going through a box of things the other day and ran across a surprise. It’s a small thing, 5×7, an oil painting, done by a Swedish aunt I never met. I only ever spoke to her on the phone once, and exchanged a couple of letters. She sent me a beautiful crystal swan when I was in my 20s, and invited me to visit, but I never did. My regret. Now that all my ancestors on that side of the family are gone, I wish I would have met her, as she still lived in the “old country.” It might have changed my life at a time when I needed it. Her last name was Anderson. I’m happy to still have that crystal swan. In fact, it inspired me to buy my grandparents Swedish crystal lovebirds on their 60th anniversary, many years ago. I now have both pieces. I’ve used the lovebirds a few times in my scans (Tree of Love is one), so their meaning can be shared in many unique ways. Mementos really do carry memories and connection. Now, all three hang together, in my blue and yellow kitchen. The power of pieces handed down over time is to keep us connected. In fact, my sister just asked me for our grandmother’s swedish recipes. I only have one written in her hand. Helping these treasures and their stories live on is one of the reasons I love creating my Telling Images. A visit to McGinty’s is always an artistic adventure! 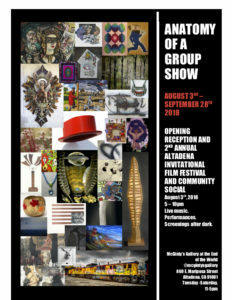 Don’t miss the Pasadena Society of Artists New Member Showcase featuring the works of Andrea Abonyi, Lisa Agaran, Nilufar Amirazimi, Maribeth Baloga, Karen Hochman Brown, Art Carillo, Patti Coyle, Brian Cruickshank, Alison Davies, Maryellen Eltgroth, Chantal Giddens, Frederick Gotha, Karen Holgerson, Marvin Jackson, Steven Cutler Linsley, Rosina Maize, Paul Martinez, Steve Ohlrich, Debbi Swanson Patrick, Margaret Raab, and Brynna Rose Ziegler. 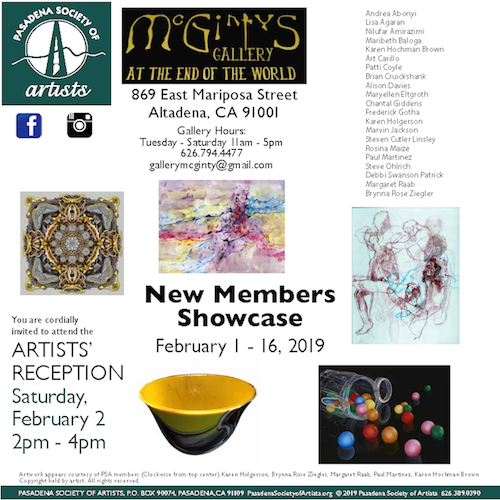 The exhibit runs February 1 through 16, 2019 at McGinty’s Gallery at the End of the World (869 East Mariposa Street • Altadena, CA 91001). Come out again for another fun party at McGinty’s Gallery at the End of the World! September 15, 2-5pm. Food and fun. Plus a lot of art! 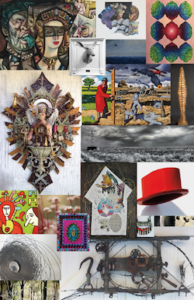 Artists include Kate Alkarni, Paul August Bruins Slot, Judith Bowman, Susan Braig, Elizabeth Butterfield, Ashoka Chhabra, Melanie Maria Ciccone, Patricia Cunliffe, Pascaline Doucin-Dahlke, Linley Eathorne, Joe Feinblatt, Pepi Feinblatt, Johnny Fox, Michael Haasis, Deb Halberstadt, Rod Holcomb, Lisa Houpt, Cammie Jones, Ildiko Laszlo, Alix McKenna, Amelia Medina, Chris Moore, Robert Moore, Gifford Myers, Steve Ohlrich, Lynne Olson, Paz, Jocelyn Pedersen, Megan Sanchez, Christie Shinn, Debbi Swanson Patrick, Pat Tom, Denise Villagran, Patricia Woodlin, Sean Yang, and Jirayr Zorthian. For more information about McGinty’s, visit the gallery’s Facebook Page. This emotionally rich piece was created from love and tragedy. 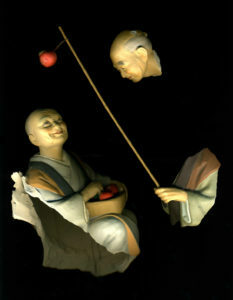 My husband, Steve, bought this figurine for his mother—a Japanese couple picking persimmons. She had it for many years until it broke during a move after Steve’s death. I took the box of pieces home and found three pieces that told the story: the wife with her basket, the husband’s smiling face, and his hand that held his gift. They float in space, three dimensional, hollow, yet full of love. So, even if you have items that are broken, but are meaningful to you, entrust them to me to create a wonderful space for them to live on. 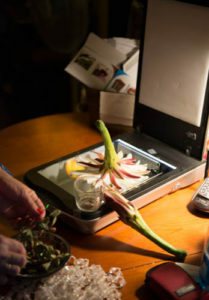 Creating a Telling Images composition involves creativity, planning, and a lot of trial and error. 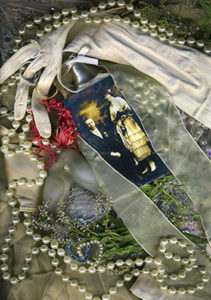 The positioning of each element and the layering of objects and textures is a painstaking, yet very satisfying process. My friend Sonia moved into a restored Victorian hotel a couple of years ago and I fell in love with it. So much so I almost opened a studio in one of the suites. The building was once the Sierra Madre Hotel, built in 1887, and lived among nothing but orange groves for years. As the city changed, the hotel became several other things including a private residence and a bordello! Judy and Greg Asbury bought the property a few years back and spent a lot of money turning it into a multi-apartment dwelling. The house is grand, with a deep front yard with white picket fence and flowers. The backyard patio was home to many barbecues and casual parties. We played piano and opened Christmas presents in the parlor, had elaborate, delicious dinners in the dining room, chatted and drank wine on the veranda. We even welcomed dozens of children on Halloween. Greg and I were discussing photography and shamanism (both of us do both of those things). I asked about any trinkets they had from the remodeling. He rewarded me with a multitude of items that were found in walls, rooms, and the garden. I collected some flowers from the garden and ran home to create. This is the result. 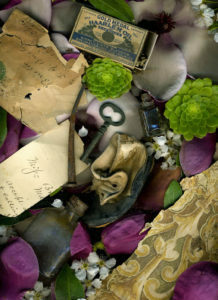 A letter more than 100 years old, wallpaper at least as old, medicine bottles from when the home was a sanitarium, the precious leather baby shoe, the square nail proving its age. What a joy to tell even just a small part of this building’s storied history in one piece of art. I hope to do more like this, for organization, community, and other anniversaries or tributes. Here is more about the house. This piece represents the kind of historical assemblage I can create to honor an event, a town, a business, organization, building, anniversary, etc. The Pinney House is available for purchase in a number of sizes. My aunt recently shared the contents of my grandfather’s trunk with my cousins and me. I was thrilled to receive my grandmother’s wedding dress, gloves, my grandfather’s matching cravat, and lots of jewelry. From these is born this memorial image of their 1920s wedding. Note the wedding rings on the glove fingers. These will go to my cousin’s children, but all of us now have a visual memory of them. Al and Hilma, both from Sweden, were married for more than 60 years. 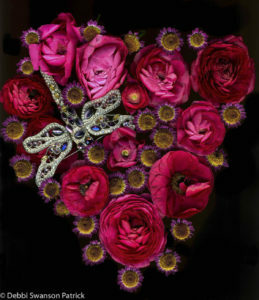 You’ll see the crystal lovebirds I gave them on their 60th anniversary in other pieces. Consider this kind of image to immortalize a family wedding and share it with future generations. Learn more about commissioned pieces. One of my joys is discovering gems in my garden. 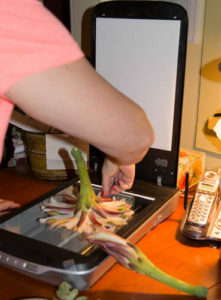 Quite often it’s the cactus or epiphyllum flowers that just blow my mind. They bloom for a night, maybe two, and they close up and fall away. That’s why I love to find them in the bud stage and wait impatiently for them to pop. The best part is there are usually a bunch that bloom within a few days of each other so it’s quite the spectacle. Occasionally I ask neighbors if I can have one or two of their beauties. I have a series of Telling Images compositions using the large cactus flowers, haven’t quite got one I like using the epiphyllum glories. Heart of the Dragonfly is one of my favorites, and is an award winner. I kept this one simple…three gorgeous cactus flowers, a delicate bejeweled dragonfly, and the man climbing and reaching for beauty. So if you have any buds popping up in your yard, call me! I’ll capture them and send you a print for your kindness!